Bagger-Sorensen & Co. A/S is the holding and investment company of the Bagger-Sorensen family represented and owned by the fourth generation Steen and Claus Bagger-Sorensen. The first company was founded back in 1915 on chewing gum production. Exports started during the 50’s and it soon became worldwide managed from the HQ in Vejle, Denmark. The gum activities have comprised branded products like STIMOROL and V6 and since 2002, development and manufacturing within Gumlink A/S of B2B gum for European supermarket chains. Today the development and manufacturing takes place in Turkey in a joint venture with the Yildiz group. In Vejle, the actual gum production takes place within Fertin Pharma A/S. The focus is on medicated gum especially nicotine gum for the B2B market. In the beginning of 2017 Fertin Pharma A/S was sold to EQT Mid-Market but Bagger-Sorensen & Co. A/S kept 30 % of the shares. Based on the NRT knowledge within the group a new company, Okono A/S, was established in 2012. Okono develops and markets innovative nicotine products containing non-combustible tobacco products for adult consumers. 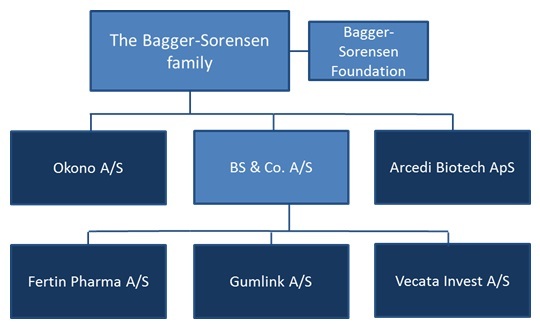 For almost two decades, the Bagger-Sorensen family has also had an investment profile though the two companies: BS Invest (real estate) and Vecata Invest (investments in the venture segment with no specific industrial focus, by invests primarily in life science, IT and technology).